‘The Verses of Vice’ is a six-track EP released by The Sangsom Massacre, an expat four-piece hailing from Thailand. Billed as dirty garage rock, this EP is spilling with energy and it’s just one of those records that you can’t help but headbang to. 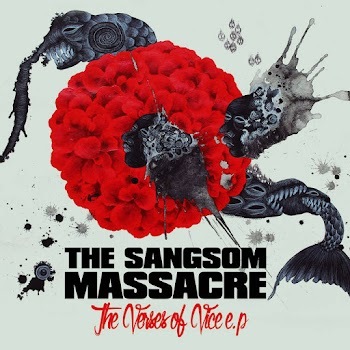 The Sangsom Massacre are a well-oiled machine in ‘The Verses of Vice’, making you wonder if perhaps you hadn’t heard them before at a rock festival in the sweaty depths of America. The whole EP features guitar riffs so grungy and dirty that you almost feel filthy in the best way listening to everything. There is something uncaring and punk about their lyrics which the lead singer spits out that sort of infects the listener to completely jam out no matter where they are. The bass guitar in every song is a constant delight, never quite disappearing beneath the aggressive guitar but just always there in the back, holding everything together. The bass riffs sprinkled liberally all over the EP is probably the thing that pulls everything together into tight, polished songs that pack a hard punch. Niall Murray’s vocals seem much more polished and experienced than you would expect from a small-time indie band hitting the big-time. The slightly screamy quality of his voice matches the smashing energy of their songs. The way he seems to sprawl the words out is definitely reminiscent of Radiohead frontman, Thom Yorke. His talents are especially showcased in Lizard People where the hissing definitely adds an edge. The vocals fall slightly short in the acoustic track ‘The Wolves at the Door’ but in no way detracts from the guitar paired with pretty piano plinks. The stand-out tracks was definitely the ending tracks ‘Lizard People’. From the get-go, ‘Lizard People’ immediately hits with a Nirvana-esque guitar riff and immediately becomes a favourite because of the great breakdown that soon follows. Also, ‘Lizard People’ contains probably the best guitar solo of the EP. This explosion of drums, guitar and vocals is an incredible way to end the EP and is probably a treat to see live. Get ‘The Verses of Vice’ here.